If you are looking for information on the Ciao Mambo MacKenzie River Pizza franchise business opportunity, Ciao Mambo MacKenzie River Pizza franchises or Ciao Mambo MacKenzie River Pizza franchising, then you have come to the right place. The original concept that would become Ciao Mambo has been in operation since 2001 and has been franchising since 2006. More importantly, Ciao Mambo has developed as a unique reflection of an ideal lifestyle - casual and fun all while being tasteful, appealing and unlike anything else. It's hard to believe that Italian cuisine like this can be found in the great Rocky Mountain West. It's Italian Nachos, Minestrone, Lasagne, Tiramisu, Chianti, Frank Sinatra, Great Fun, Wonderful Service and a whole lot more. If the atmosphere and friendly attitudes don't seduce you, the pasta will. We serve hearty soups, appetizers, and salads; pasta dishes with rich, savory sauces and fresh ingredients; and thin-crust pizzas hand-tossed and baked to perfection. Our exciting, distinctive recipes feature only the highest-quality ingredients - such as fresh mozzarella, heavy cream, sliced Reggiano cheese, top-grade meats and crisp produce. The Ciao Mambo concept is far more than just great food. Despite the heavy competition in the restaurant industry, we believe that the Ciao Mambo concept appeals to guests because our restaurants pair high-quality food and service with a happening family ambiance. Enjoying great Italian food never seems to go out of style. Our franchise program is more than just a great opportunity. It's a well-planned, fully supported system. 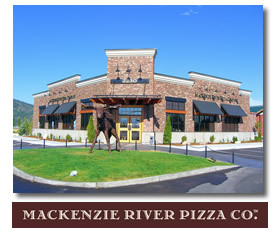 The first MacKenzie River Pizza Company opened in 1993 in downtown Bozeman when Montana had yet to experience truly gourmet pizza. Many looked at us sideways with our wild ideas of basil pesto, sliced almonds and Mandarin oranges as pizza toppings. We even put pears on our salads and who'd ever heard of that?!? But our guests caught on quickly, calming down to take note of our excellent pepperoni, Italian sausage, bell pepper and mushroom toppings as well, and it wasn't long before all of Montana came to love and trust our distinctive flavors, famous sourdough and Italian thin crusts, big salads and unique sandwiches, all served amidst authentic Montana decor by an always-friendly staff. Mackenzie River Pizza Company boasts exclusive menu items that are always flavorful and fresh, and served up in heaping portions. Treating yourself to MacKenzie River means treating yourself to gooey, cheesy Lodgepoles™, a pile of cowboy nachos, and sizeable-sensational-salads. 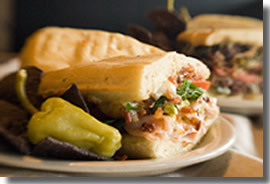 It means feasting on one of a kind sandwiches, hearty chicken chili and mouthwatering microbrews. And of course, you can expect to eat pizza that is both delectable and distinctive. MacKenzie River Pizza Company food is everything you crave - plus much more. Mackenzie River Pizza Co. is an appealing concept with plenty of potential for growth for savvy restaurant owners ... that also just happens to be fun to operate. The MRPCo. concept has a broad appeal: from kids who come in with their parents, to senior citizens and everyone in between, guests can always find something to love. Multiple day-parts (lunch and dinner, seven days a week), multiple potential revenue streams (food and beverages, including wine and beer, take-out and dine-in, even branded retail items), plus single and multiple unit ownership options all mean one thing: ample opportunity for franchise owners. Our extensive experience in developing locations and managing a group of restaurants. Pizza represents almost $40 billion in sales per year. The reputation and recognition of the our names that extends beyond its original geographical focal points. Being part of an established system and brand. Having a business that is fun to operate and has reasonable working hours, compared to other restaurant concepts. An appealing concept in a market with plenty of growth potential. Help from our professional and experienced staff, from pre-opening training teams to field reps that visit your location periodically. Relationships with approved vendors and other key suppliers. Support with appropriate site build out, including restaurant and kitchen layout, exterior and interior design, plus equipment, fixtures and furnishings. A confidential and comprehensive operations manual and reliable online resources that provide all the details necessary to run your restaurant. Guidance on hiring, training, and retaining qualified staff. Marketing overview and advice to create 'buzz' among potential guests and establishing goodwill in your community through smart advertising and promotional programs.